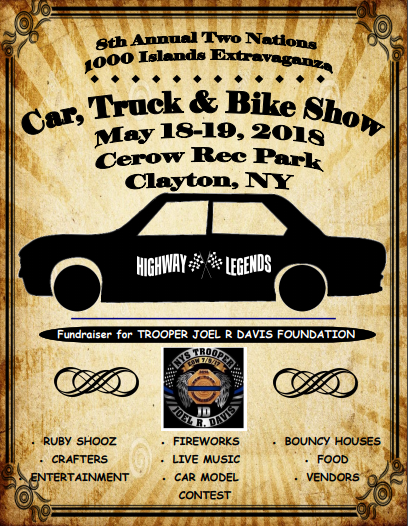 Highway Legends Car Club would like to invite you to beautiful Clayton NY for the 8th Annual Two Nations 1000 Islands Extravaganza that will be held Friday and Saturday May 18th and 19th. The event runs Friday from 4-9pm and Saturday from 10am until 9pm. Friday evening will either be a drive in movie or a sock hop! Either way, it will be lots of fun! We will have the band Ruby Shooz, out of Rochester, NY performing for us for 4 hours on Saturday and ending with a wonderful fireworks display! Ruby Shooz pays 50’s and 60’s music. Awards will be handed out on Saturday afternoon. There will be lots of crafts and vendors, music, food, kids games and of course, lots of cars, trucks and bikes!